This delicious sauce is perfect for dipping chips and vegetables or as a topper for enchiladas or taquitos. This Mediterranean inspired sauce is made with creamy ancho chicken, Campbells® Cream of Chicken Condensed Soup, caramelized onions and shredded pepper jack cheese melted to perfection. garlic, peeled, minced	 2 tbsp. dried rosemary leaves, crushed	 1 1/2 tbsp. crushed red pepper, flakes	 0 1/2 tsp. 1. In a large pan, heat oil over medium-high heat. Add onions and peppers. Sauté 5-6 minutes. Stir in garlic, rosemary and red pepper flakes. e Cook for 2 minutes, stirring often. 2. Add artichokes. Cook until heated through. kosher salt	 0 1/2 tsp. 3. 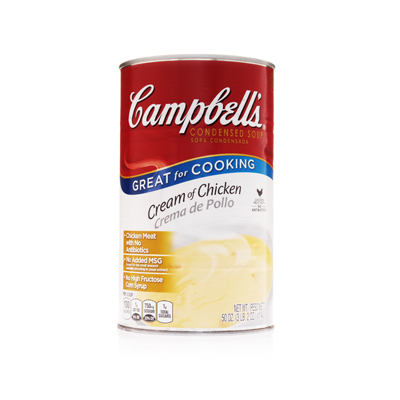 Add Campbells® Cream of Chicken Soup and water. Bring to a simmer. 4. Stir in chicken and salt. Return to simmer. 5. Mix in cheeses and parsley. Reserve. CCP: Heat to a minimum internal temperature of 165°F for 1 minute. CCP: Hold for hot service at 140°F or higher until needed. 6. To Serve: Using a 4 oz. ladle, portion 1/2 cup hot sauce into an oven-to-table ramekin. 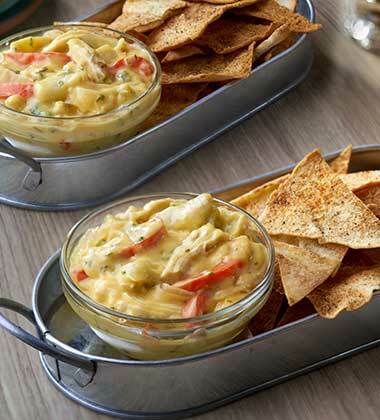 Serve with 1 cup pita chips. Serve immediately. dried rosemary leaves	 1 1/2 tbsp. crushed red pepper	 0 1/2 tsp.